Please Note - Spoilers Feature Throughout The Review. 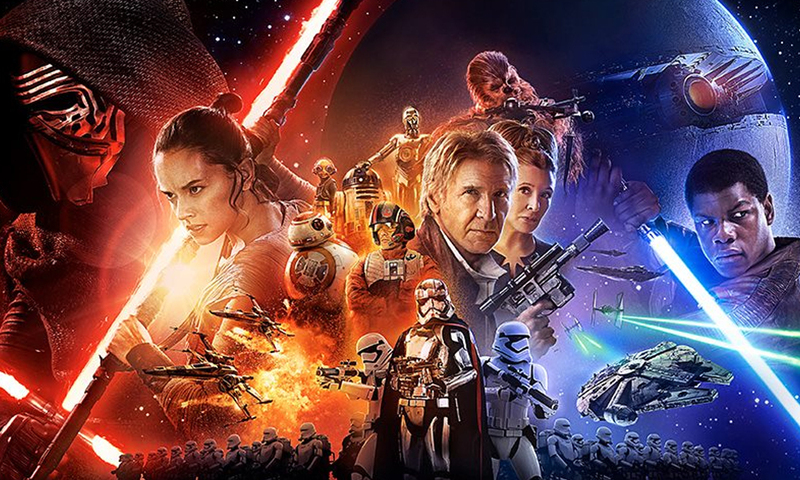 One of the most hyped movies in recent times, The Force Awakens mostly justifies all the hoopla. It also goes to a long way to banish the feelings of aghast dejection that movie goers and sci-fi fans alike had when The Phantom Menace first manifested itself on the big screen. My biggest concern in the preceding months was that handing over to Disney may not be enough to alleviate the problems that were so apparent with a George Lucas who had far too much creative control compared to the original trilogy. I had heard great things about J.J. Abrams, but had not managed to catch any of the films he helmed. I also was not yet a Star Trek aficionado, so had little idea of the skill Abrams possessed in taking a lot of well known tropes and breathy heady new life into them. Of course, as anyone who has seen this blockbuster will attest, the plot has been done many times before, and not least in A New Hope. The basic concept of an evil force in the galaxy determined to crush any resistance they encounter, and who do not spare a second thought in destroying any number of planets to achieve the goal of ultimate power is present and correct here. Having a vital piece of information hidden in a droid is also brought back, but crucially the difference this time is that information only sets up the very end of the film, and is distinct from the customary action climax. Instead, a turncoat in the shape of Stormtrooper FN-2187 - now renamed 'Finn' - is able to offer vital knowledge so as to help the destruction of the weapon. However, there are many other reminders of the 1977 classic, with some being more solid than others. A beginning on a desert planet where a young person who has been estranged from family yearning for a better life. A hot shot pilot who plays their part in the final battle, and does so without batting an eyelid - even if he risks total destruction. A masked villain who harbours resentment for an old man who has played his part in countless battles. And that aged genial figure quickly becoming both respected and loved by the younger heroes we are introduced to. The arc with Finn is definitely the freshest, and his romance with Rey is engaging. How they spark off one another ends up being rather coy, when compared to the one with Han and Leia from the original trilogy. The film even avoids a predictable pay-off for them, by leaving Finn in a coma-like state. The former warrior of the First Order does get the consolation (if one could call it that) of a peck on his forehead by the lady he so cares for. Daisy Ridley does wonders with the stretches that introduce her, featuring almost no dialogue. It takes a chirpy, tiny droid to get her into the adventure, but from then on this athletic young woman never looks back. I found myself always engaged by Rey, and she is a very much a 21st century-type female, who just happens to be situated in this 'Galaxy.. Far Far Away'. The range of emotions shown by Ridley is strong, and she combines both the light-hearted banter and the material that verges on melodramatic with aplomb. Finn is decent in terms of character and acting execution, if perhaps given more than a fair share of mundane material. I wish he had been in a battle or two proper in serving the First Order, and the consequences of those actions only now had caught up with him. Also it would make his handling of some Stormtroopers later on more believable. But all the same, John Boyega is a fine choice for a man who has a heap of emotions, and is trying to figure out his new direction in life. Despite my age, and the demographic BB-8 is aimed at, I still found this new droid utterly spellbinding, and a crucial part of what made the film enjoyable across its two-hour-plus running time. I thought I would miss the iconic pair of Artoo-Detoo and See-Threepio, but I accept they had a pretty reasonable quotient of material in all six of the prior Star Wars entries. It is still a delight to have them turn up briefly: the golden protocol droid irritated by his patchwork red arm; and the diminutive techno-wizard, (as well as co-pilot to Luke) suddenly whirring to life and completing the much-sought-after map. Turning to the despicable villains now, I was quite impressed by the key antagonist of Kylo Ren, who is enjoyably caught in two minds. He clearly cannot banish the good in him and has some form of a conscience, but also is desperate to project an image and demeanour that is purely antagonistic and malicious. There is that tantalising hope for a good few seconds he will come back with Han, but ultimately he chooses the Dark Side. There is still however not the same ability to let the negativity and hatred infuse him with total power, and that may be one factor why he struggles in the fight with Rey - even accounting for his injury. The inferiority complex regarding how much he matches up to grandfather Darth Vader is also intriguing. The film just gets the balance right, in having a moody, tantrum-prone villain who still has menace and gravitas. I look forward to more screen time with Adam Driver in this pivotal role in later Episodes. However I have issues with the secondary opposition. To my sensibility, General Hux was a very limp and forced villain. We have witnessed slimy, jobsworth types on the side of the Empire beforehand, and also there have been incompetents like the ill-fated Admiral Ozzell (Michael Sheard) from Episode V. But Domhnall Gleeson is mostly just bluster and glares, and not much else. Normally he is a rock solid dramatic actor, but perhaps he does not fit into this type of movie so well. The gripping build up to the destruction of the New Republic worlds still works, but would have been even more powerful with an actor that conveyed a cold-hearted and detached self, as was the case with Peter Cushing's Grand Moff Tarkin in the very first film. For a big Game Of Thrones follower like myself, I was excited to have Gwendoline Christie now playing a similarly powerful, (but here now) clearly evil warrior. We do not see her Captain Phasma unmasked, however. If she is to indeed return I hope this is remedied. She has a great amplified voice, and we somewhat fear for Finn when she notes his disobedience. Perhaps one or two scenes cut for time with Phasma would have helped make her feel more relevant to the film, if retained after all. Too little time is spent on Supreme Leader Snoke for me to have an opinion one way or the other. The mystery for now is whether he is indeed as colossal as he appears, or just using a hologram program to try and make up for some form of insecurity. How and why he turned Kylo to the Dark Side must also be expanded upon, as the dialogue given carries very little explanation. On a clearly positive note though, I did enjoy the use of the Stormtroopers throughout. Several brief moments were there to show how they were not just killer drones but had a bit of life and humour of their own. The Daniel Craig cameo may well pass over many viewers' heads, but it is still a winning moment, and also an important one as Rey first masters the renowned 'Jedi Mind Trick'. The snow-covered fight in woods is a beautiful scene, and arguably overshadows all the frenetic action with the Resistance overcoming 'The Weapon' (which makes the previous Death Stars look like small-fry). Kylo Ren is injured, and so relies upon adrenaline as he faces a Rey who is developing Force powers every single passing moment. However, she should still be beatable. What transpires however, is Kylo desperately lashing out, and he is lucky not to perish. But then this first episode of a new trilogy has great plans for future clashes between the two. A convenient fissure that separates the two combatants by a sizeable distance is perhaps contrived plotting, but also a nice way to add meaning to the usual 'Enemy Base exploding' cliché. All three of the original trilogy ' triumvirate' are back in the form of Harrison Ford, Carrie Fisher and Mark Hamill. The latter two have significant parts to play in the actual plot, but get very limited screen time - particularly in Hamill's case. But this does not hold the film back, and actually works to the benefit of a saga taking on new direction and purpose now that a different crew and distributor is behind it. I will focus mainly on Ford's Han Solo. He is the cream of the original trilogy ensemble crop for most viewers, but there was all sorts of speculation as to how big a role he would have this time round. The first act takes place in a dizzying rush, before the story gains focus with the arrival of Solo striding onto screen, and still with Chewie (Peter Mayhew) by his side. Though the on-off smuggler looks haggard and worn, he still oozes joi de vivre and has that classic sardonic wit. He quickly bonds with both Rey And Finn, and helps make their story take on another dimension or two. Some speculation has occurred since the film's release that Han and Leia are not only Kylo's parents, but Rey's too. Certainly it would add more meaning to Han's conclusive death at the hands of the son, who was named 'Ben' after the late Jedi Obi-Wan Kenobi. The scene plays out well enough, if also perhaps quite telegraphed. The aforementioned battle in the snow needed a big loss to justify the raw emotion Finn and Rey show in taking their stands against Kylo. I still partly question if Han could have kept a safer distance and tried to persuade Kylo to disarm, but then that is easy to say from the outside. Clearly Han's heart ruled over his head for once and he pays dearly. I am totally convinced that this (most likely) final turn for Ford is one that is much better than Return Of Jedi once was. There at times it seemed Indiana Jones was having a guest role in the Star Wars universe. Ford clearly responds well to Abrams' direction, and shows the level of acting chops he acquired in the meantime; not least when he gained an Oscar nomination for Witness. To have the heart of the movie feature Ford is a great way to involve established fans, but also makes the journey for the new characters feel a lot more poignant. And although Han faces the full force of a lightsaber, and his body falls down a massive chasm, this ultimately is a good way to go out for such a swashbuckler. Carrie Fisher is in some respects unrecognisable as Princess Leia, as far as looks and voice are concerned. Of course, over three decades have taken their effect on her since Episode VI was released. Fisher has had a very up and down life, but always been a likable Hollywood star, and her presence is most welcome. She manages to infuse the emotions for Han equally well: one moment there is disdain, quickly followed by another moment of long-term love and warmth. She also does well to bond with Ridley with the most meagre of dialogue, and that makes the closing stages of the film stronger. There clearly will be more need for Fisher in Episode VIII on the evidence presented. As for Leia's brother, I am delighted to say that the final scene with Luke is a winner. John Williams' backing music fits perfectly as the camera pans round the island where the last of the Jedi has chosen to hide himself on. I half-suspected that the film's title indicated that there is little Luke, but he is still the MacGuffin and so drives the majority of events. His presence is strongly felt in the nightmarish vision Rey has when visiting a part of the temple, and that experience makes the final decision to locate the heroic son of Anakin Skywalker more significant as well. This film is a true must-see for all Star Wars fans, and anyone who likes escapism with vigour, humour and romance. It should create a whole new generation of youngsters spellbound by the Force, the Good versus Evil faceoff, and the various space battles involving TIE Fighters, X-Wings, and the legendary Millennium Falcon.